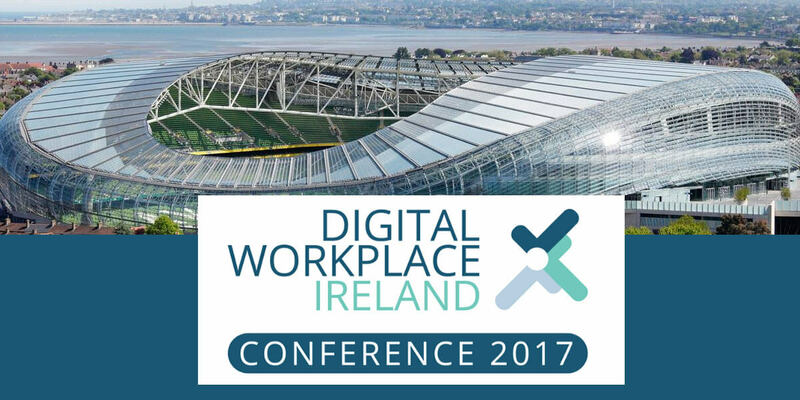 The Digital Workplace Ireland Conference 2017 takes place at the Aviva Stadium on 15th February. Today's workplace is constantly changing and developing and the pace of this change has increased dramatically over the past few years. The rigid and traditional perception of the workplace, with its static locations and times is being revolutionised by a new generation workforce and customer who think and communicate in a radically different way – a digital way. The organisations that will thrive are the ones who will enbrace this change and shape their future around the new Digital Workplace. This conference is aimed at organisations who want, or are attempting to create and shape a digital workplace, one that will dramtically reduce paper usage and dependency, create business process efficiencies, increase staff productivity and job satisfaction, unlock and leverage valuable data currently trapped or lost within an organisation and deliver it to the right people at the right time to improve organisation performance through analytics. This unique conference will feature talks and presentations from Europe's leading experts on the challenges that organisations are facing and how digital transformation can help them resolve those challenges. To back up the theory, there will also be practical demonstrations of the latest solutions the top global companies are deploying that are overcoming the new Digital Workplace transformation challenges, creating efficiencies and driving business forward.